The lamuyo type fruit is 9.8 cm long and 7.3 cm in diameter, weighs about 170-190 g, and can be harvested at about 105-110 days from sowing. It has unique fruit color, and tastes sweet and crisp. 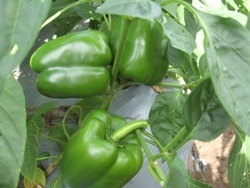 The young fruit is green, and the mature fruit becomes red, suitable for salad or frying. Resistant to PVY.